PRESS RELEASE: Drum Workshop, Inc. recently unveiled a new line of quality, yet value-priced, snare drums aimed at working drummers, students and weekend warriors everywhere. The aptly named Blackout series features a stealthy black on black appearance that is neutral enough to fit in with every kit. Designed to offer a quality, all-maple lacquer drum at a very competitive price, the Blackout Series is available in 6"x10" (retail $218.99), 4"x13"(retail $272.99)", 5"x14"(retail $272.99) and 6"x14"(retail $272.99) sizes and features an all-maple shell, high gloss black lacquer finish, side-to-side throw-off, oval lugs and Remo heads. Vice President of Sales, Jim DeStefano, explains, "It's obvious that drummers are seeing better values than ever at their local drum shops. Long gone are the days when drum companies can down spec products and still get the sale because the price is right. The fact is that the market is flooded with really good sounding stuff for a fraction of the price of what drummers used to pay, even ten years ago." 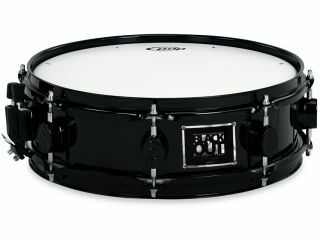 "We think our Blackout snares are PDP's answer to today's expectations."